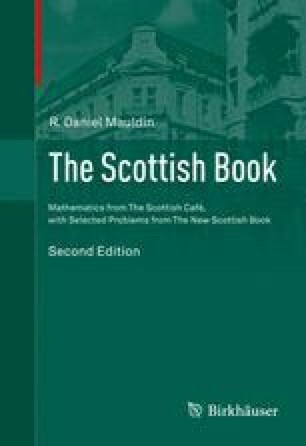 I shall discuss several problems which are connected with the Scottish Book. Let me start with a problem which F. Bagemihl and I solved. Everybody knows Riemann’s theorem: A nonabsolutely convergent series of real numbers has the property that for any preassigned number a the series can be reordered to converge to a. Bagemihl and I proved that for the Cesàro sum of the series there are three possibilities: On reordering the domain of convergence is just one point or it is the whole line, or it is an arithmetic progression (this last possibility does not occur in Riemann’s theorem). Our paper appeared in Acta Mathematica in 1954; later we found that it is Problem 28 of the Scottish Book, due to Mazur.